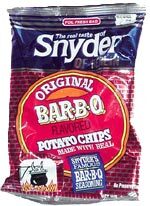 Taste test: These are very flavorful barbecue chips. They're quite salty, but also quite sweet, and there's even a spicy aftertaste. Not all that crunchy, though. Smell test: Mild barbecue/paprika smell.